We offer 3 Cosmetics separately at a favorable price. Impuls Deo is a mysterious, sensual and oriental fragrance. The scent is fresh and subtle floral combined of jasmine, wild violets, grapefruit, vanilla, white musk and wood. It is available as perfumed deodorant spray. 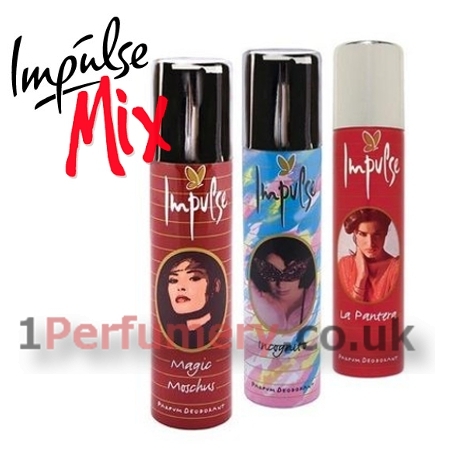 Ann Gotlieb famous designer perfumes created the impulse, the first product listed within the concept of perfume deodorant was in 1972, the elegant and seductive tones of Orange, jasmine, rosewood, vanilla and musk. The impetus was produced by Fabergé, which belonged to the Anglo-Dutch company Unilever. The brand began in 1972 in South Africa, and in 1979 in the UK.